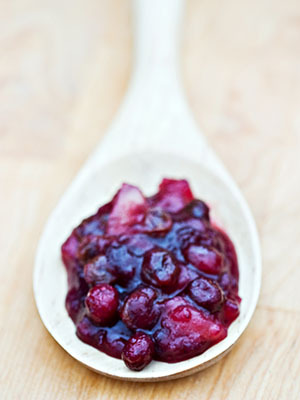 Cook cranberries, apples, currents, zest, maple syrup, salt and juice in a large sauce pan. Cover and bring to boil. Reduce heat and simmer for 20-25 minutes. Remove from heat and add walnuts. Serve at room temperature. This is a great substitute for those canned cranberries!